Samuel’s wife, London-bred Susanna, also had literary and theological gifts—and a practical orientation that allowed her to get along in their rural setting. But she was not afraid to question her husband’s authority. John absorbed ideas from both of his unusual parents, but his mother clearly had the strongest influence on him. Indeed, Elsie Harrison’s incisive biography of John is titled simplySon to Susanna. Susanna earned quite a reputation for squabbling with her husband over theology and politics. Letters to a nearby noblewoman and a renegade conservative cleric reveal details of a marriage—threatening quarrel over who was rightfully king in 1701. Both Samuel and Susanna supported high church principles and royalist politics, but he had made his peace with the new regime of William and Mary (put in power by Parliament), while she had not. One evening she refused to add her “Amen” to the standard Book of Common Prayer petition for King William during family prayers—a not-too-subtle indication of her support for the exiled Stuart family, whom she believed ought to continue to rule by divine right. Bolstered by the advice of friends, Susanna stuck by her decision and refused to yield to her husband’s protests. He finally told her, “You and I must part: for if we have two kings, we must have two beds.” In fact, they did part for a few months. Samuel withdrew to London, giving Susanna the only break from pregnancy in her whole reproductive life. A fire in the Epworth rectory (and a new monarch, Queen Anne, whose pedigree they could both believe in) brought the couple back together. 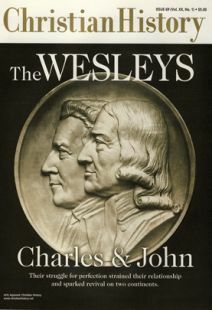 The fruit of their reconciliation was born June 17, 1703, and christened John. The second clash occurred nine years later and also involved the rector’s absence. Samuel traveled to London as a delegate to the Church of England Convocation, and he left the parish in the hands of a lackluster curate. Susanna took up the slack by welcoming parishioners to join the family prayers she was leading Sunday evenings in the rectory kitchen. Soon these evening services (technically illegal, since any unregistered religious meeting outside the parish church could be regarded as a nonconformist “coventicle") came to the attention of the curate, who tattled to the absent rector. Samuel wrote Susanna from London and demanded that she cease and desist. Though harsh-sounding to modern ears, the practice included fair but firm application of house rules, one-on-one instruction in reading and religion, and a special determination to educate her daughters beyond the usual expectation. Each child claimed her undivided attention at least once a week. The methodical child-rearing left a strong imprint on “Thursday’s child” and clearly influenced the highly disciplined movement he started some three decades later. John published her famous letter on child rearing in his journal and recommended her approach more than once in his sermons. Charles Wallace, Jr., is chaplain and associate professor of religious studies at Willamette University in Oregon.